In a dry non-stick pan, add the oil, garlic, onion and pimento. Then turn the stove on low heat. Allow to cook until translucent. Add the chopped spinach, salt and pepper. The spinach will begin wilting until broken down and easy to cut with your spoon. Add cream cheese and stir until melted and combined with spinach mixture. Add cheddar and mozzarella blend and turn off the heat. 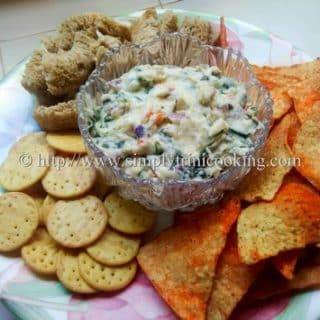 Transfer to a serving bowl with your favorite chip, cracker, or bread. Additionally, use as a spread for sandwiches.